When I got this book, I never realised that the author has already penned few novels. I was made aware of this fact due to the presence of abstract of couple of stories in the end of the novel which seemed equally interesting and intriguing. 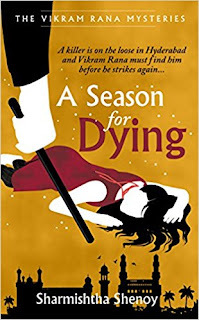 Coming to the actual novel - A Season for Dying is a perfect title for the novel since the death occurs eliminating one character or the other throughout the novel. It all begins with a murder of a housewife and it continues with the killing of few more including doctors. The killer wantedly leaves behind a note mentioning the date for his next hunt. The cops get into action and they get more annoyed when the killer challenges their talent and wanted to teach him/her a lesson. ACP Gopi Reddy gets in touch with his ex-colleague and friend Vikas Rana who is now the famous detective. Did they manage to unfold the mystery is the story. What I liked the most is the way the story went. It would make any reader including me to keep guessing as to who would be the potential killer but in the end, it was a real surprise. A perfect weekend novel which is best enjoyed with a snack and tea/coffee to beat the boredom. There are lot of characters in the novel which you need to remember. I would suggest to make a note of them so that you will not get confused at any given point in time. These characters are very much required and hence there is no complaints whatsoever. This is a usual crime novel with an unusual twist.